The groom came by Rolls-Royce, the bride in a helicopter. Hundreds of VIP guests attended to get a closer look at the starry-eyed couple: a pair of bewildered cats. Any celebrity would have been proud of the sumptuous $28,000 wedding. After the ceremony, the clearly monogamy-loving cats, Phet and Ploy, were sent on a honeymoon river cruise – to be followed by visits to the vet. You may be curious who played as the groom’s (Phet) best man. Luckily, a parrot agreed to act the part. As for the bride’s (Ploy) maid of honour, an iguana embodied the role eagerly. 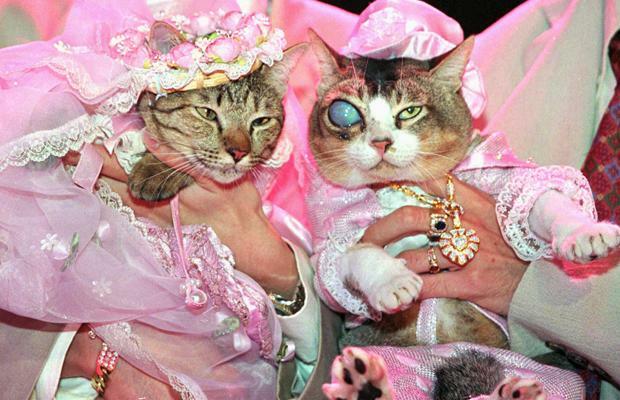 Having more than 500 guests, the cat couple garnered over $60,000 worth of cash and gifts. Their owner, Vicharn Jarat-archa, staged the wedding because business started booming at his cosmetics company right after he found Phet along the Burmese border. The male, part-Siamese cat had a “diamond eye,” which Thais regard as a lucky omen. The condition is a type of glaucoma. A hard, blue coloured film that develops over the eye, leaving the cat blind, unless treated in its early stages. Vicharn later returned to the same area and found Ploy, a female with the same eye condition, and began planning a love match because the two disease-stricken cats were obviously in love. “We are not doing this for publicity, but to show that animals also have their rights, and that we love them,” Vicharn said. And so he gave them the “right” to mate in hopes of increasing his luck with a litter of blind glaucoma kittens. Animal activists protested, and urged Vicharn to have the cats treated rather than used for profit and publicity. Vichard promised to have their eyes looked after and to donate wedding gifts to animal welfare charities, though it was not certain who would get the $60,000 dowry. At the wedding, Phet, aged about 3, wore a custom made pink tuxedo with lacy cuffs while Ploy, aged 4, was attired in a matching pink satin wedding gown. Rings were made to fit their paws. 9 haunted places in Bangkok you didn’t know about… Dare to get your back rubbed by a criminal?